From the first moment you hold her, this tiny, little peanut is sure to make you fall in love! From the first moment you hold her, this tiny, beautiful “Little Peanut” is sure to make you fall in love! It's no wonder she ended up with such an adorable nickname! Created by renowned Master Doll Artist Tasha Edenholm, Little Peanut is an amazingly lifelike baby doll,from her bright blue eyes and little peanut nose to her tiny fingers and toes. 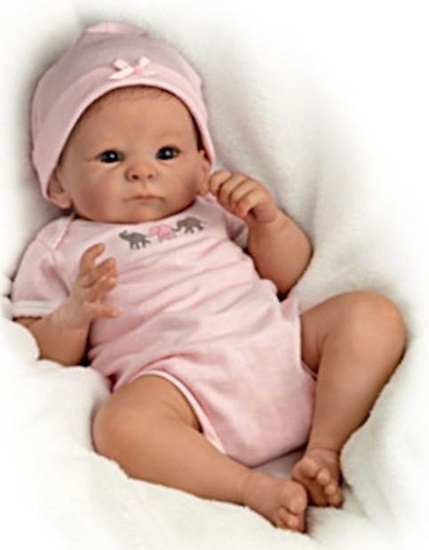 This fully poseable baby doll is weighted to feel like a real baby, and she is superbly handcrafted with soft RealTouch® silicone-vinyl skin, expressive hand-painted features, hand-applied brown hair and more. “Little Peanut” comes dressed in an outfit that matches her personality, a pink onesie with scalloped picot edging on the neckline and short sleeves, and a parade of elephants marching across the front. A pink satin bow is nestled in her baby fine hair, and a matching pink cap completes this precious little outfit. At 17-inches long “Little Peanut” is absolutely irresistible! Created by Violet Parker, and fashioned from RealTouch silicone- vinyl, hand painted and blushed to have the look and feel of a baby's soft skin, Baby of Mine will win your heart over the first time you hold her.